The William G. Milliken State Park and Harbor is the first urban state park in Michigan, encompassing 31 acres of land along the Detroit River. 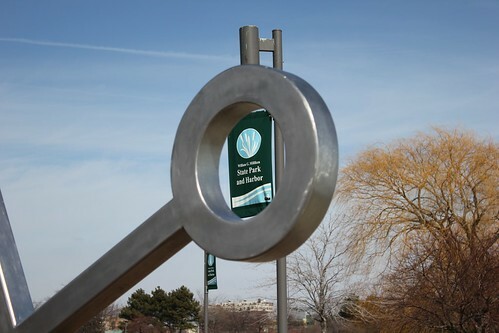 Connected to the Detroit RiverWalk and the Dequindre Cut, it is a great place for a quiet walk, a leisurely run or a casual bike ride along the river. For boaters, the park has a 52 slip harbor. And when the Globe Building Outdoor Adventure and Discovery Center is completed next year, people interested in archery and camping will have the chance to discover these firsthand before heading outdoors. My hike through the park Saturday was a little chillier than the mid-50’s temperatures felt in the rest of Detroit, but the ice melting and floating down the Detroit River contributed to the colder air temperatures along the park. There were people taking in their fill of ice fishing before it all disappeared, as well as many people talking the opportunity to run and hike through the park to the Dequindre Cut. Still, it was warm enough for me to sit by the restored wetlands, which always offers a calm oasis in the middle of a hectic city. Here is a slideshow of photos from my walk.